Asian Blepharoplasty, also termed as ‘double eyelid surgery’, is a cosmetic procedure in which the fat present in the upper eyelids of the patient is eliminated in order to provide her a pretarsal crease and a bright-eyed appearance. These types of eyes, which lack creases in puffy lids, are mostly visible in Asians and hence, the procedure is named so. It not only makes the application of eye products easy but also creates a westernized look. The process of the Asian blepharoplasty mainly involves the removal of a certain amount of extra skin present on the eyelids and some fat pads as well as tissues underlying it. The creases need to be formed efficiently and the incision needs to be healed perfectly. ‘Full incision’ can be done by making a long incision from corner to corner of the upper eyelids in which the scar takes maximum time to heal and leaves no visible mark. More than one small incision can be made across the upper eye lids in order to perform a ‘partial incision’ procedure. It is a great way to fat removal with a very little scar and naturally dissolved outer sutures. The surgeon can also replace the incision(s) with sutures from side to side of the eyelids in ‘no incision’ method. It does not lead to a scar, but can result into severe inflammation. You need only 1 hour to undergo this surgery. Those who have upper eyelids full of overhanging fat with no significant crease should consider themselves as ideal candidates for this procedure. They should also have good health and no addiction to smoking or drinking. The surgical procedure gives big beautiful eyes by creating creases on the upper eye lids where no natural crease is formed. There is no need to stay in the hospital during post-surgery period. But it will take at least 6 weeks to get back to your normal schedule. The healing actually starts after 2 weeks of the surgery. 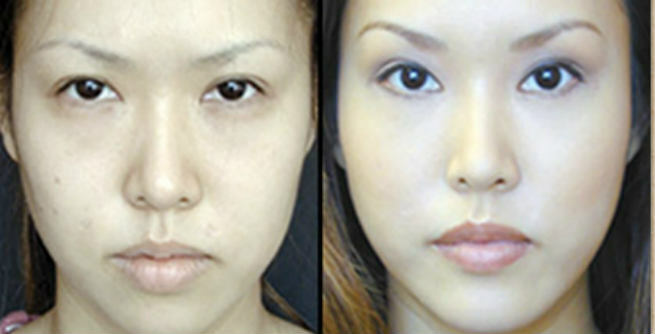 Asian blepharoplasty may come up with certain mild to major complications. Various risks and side effects associated with the procedure include infection, swelling, bleeding, anesthetic reaction, scarring, loss of fold, multi-fold development, out-folded eyelids, ptosis, asymmetry, sagging of the lids and brows, damages to the lid-elevating muscle levator aponeurosis, chronic dry eye, permanent changes in vision, etc. Removes excess skin and fat from upper eyelids. Alters the shape of the skin in the eye area to create folds and creases or bring changes in their height to provide a real finishing. Eradicates the bulging and tired look from eyes. Makes the application of eye products easy. The average cost of an Asian blepharoplasty may vary between $3,000 and $5,000 depending upon the type of surgery performed as well as the amount of fat removed.